Bring your toonies to Kwantlen campuses this week — START is hosting a cupcake bake sale to benefit the Heart & Stoke Foundation of BC & Yukon. The cupcake sale starts Wednesday, March 2, in the rotunda on Richmond campus from 11 a.m.-4 p.m. and moves to the Surrey courtyard on March 3. Cupcakes cost a minimum donation of $2 and proceeds go to supporting the KUSA START Volunteer Big Bike teams which will ride May, 20 at 4 p.m. and 5 p.m. at Central City in Surrey. Cupcake sales have become a fairly common sight on Kwantlen campuses and have been used to raise money for everything from graduation events to breast cancer. This is the first time the START program has run a sale benefiting the Heart & Stoke Foundation said Naveen Zafar, START’s volunteer mentor. 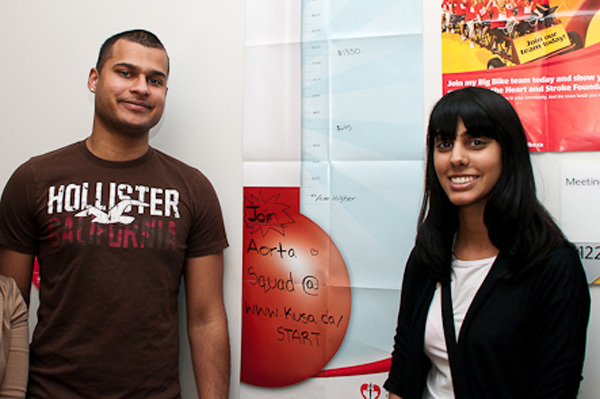 The START Volunteer program was established in 2010 with a goal of connecting Kwantlen students with their community. Zafar and several other volunteers had been involved with the Heart & Stroke Foundation in the past but had never organized anything through Kwantlen. “The Heart & Stroke Foundation has nothing to do with the bake sale; we are just donating all of the money because we believe it’s a good cause,” said Zafar. Many of the volunteers were interested in baked goods, so START purchased close to $195 worth of cupcakes from a bakery that uses all-natural ingredients. The Grassroots Cafe will also be donating hot chocolate and iced tea for the sale. START has a goal of raising $2,000 from the cupcake sale and other donations but Zafar believes they will be able to raise much more. According to the Heart and Stroke Foundation, there are an estimated 70,000 heart attacks in Canada every year; that equals one every seven minutes. Over 16,000 people die as a result of heart attacks each year in Canada. More on the START Volunteer program. More on the Heart & Stroke Foundation of BC and Yukon.